The prayers and love of a vast number of people focused upon lifting and shifting a situation can change the probable future. May your love expand and lift you into higher consciousness, where a more beautiful world is in the process of formation even now. I offer love and blessings to the new President Elect of the USA, as well as to all the diverse people of America and invite you to do the same. 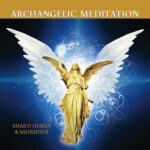 These meditations were recorded at the Abode of Peace Ashram with Shakti Durga over 3 consecutive weeks to help lift and shift feelings of fear following the the USA 2016 election. You are invited to make a donation via the Shanti Mission website if you find the mediations of benefit.